Part 12 - Where was I? Oh aye! When i started this blog it was supposed to follow the story roughly speaking of where we got where we are, and then very conveniently dovetail with now. Then i could keep it more relevant. But i've dipped in and out of a few things since the last part which was Part 9 - Whats a Bon Accord? I'll nip away and re-read that to see where i was. Ok, read it. Sorted. Ready to go. So the design is locked down - kudos to Nicola, my pal Craig and my brother Mark for their input. Worth mentioning here that you very quickly have to accept criticism and suggestions. Sometimes its right! Even though i think its important to have the courage of your convictions - you need to be flexible and honest. If something works better another way - do it. Although the Annie Street Dreams deck had a few colours in it, there was a degree of flexibility with the design. A millimeter here or there didn't really effect the image. However with this one i had to line up 4 screens with 4 different colours to create one image. Easy eh? So some of the first things i discovered was that overlapping the images was the way forward. No overlap means you have to get it BANG on. i.e. line up the screen to the image each time and ensure that its millimeter perfect. Not easy. Especially when screening on a curved deck! Also needed to think about which direction to screen. You pull (or push if you like it that way) the ink through the screen and that deposits the ink onto your deck. A squeegee is used but they aren't really soft enough (that i've found) to take on the curve. So i screened width ways - this has its own issues. The contact between the deck and the screen can be an issue and the pressure you put on makes all the difference. Too much pressure on the part closest to the screen means you are going to make a mess - not enough pressure on the part furthest from the screen means you arent going to deposit enough ink. Overlapping images for sure - i'm in the midst of re-doing some of the images so that i can get the next one bang on - Irn Bru colour fyi. Then i thought - why can't my squeegee be curved? So i chopped one up and......it kind of worked a treat! Still some work to do to make one perfect but its the way forward for me. Part 9 - Whats a Bon Accord? So its around June/July time and i'm beginning to get the anxiety that can be best described as "2nd Album syndrome". Its around this time that i think about my youth and the joy of Bon Accord ale. For those not in the know - this was a drinks company that rolled around the housing estates in big flat bed trucks shouting "bon accord". Occasionally you would convince your mum to buy a bottle of their finest Limeade or Red Kola! Great days. Bon Accord is of course (i say of course in terms of those from Aberdeen!) the motto of Aberdeen, and is French for Good Agreement. I won't get into a history lesson here but this also involves Robert the Bruce and Wars for Scottish Independence. Interesting stuff! 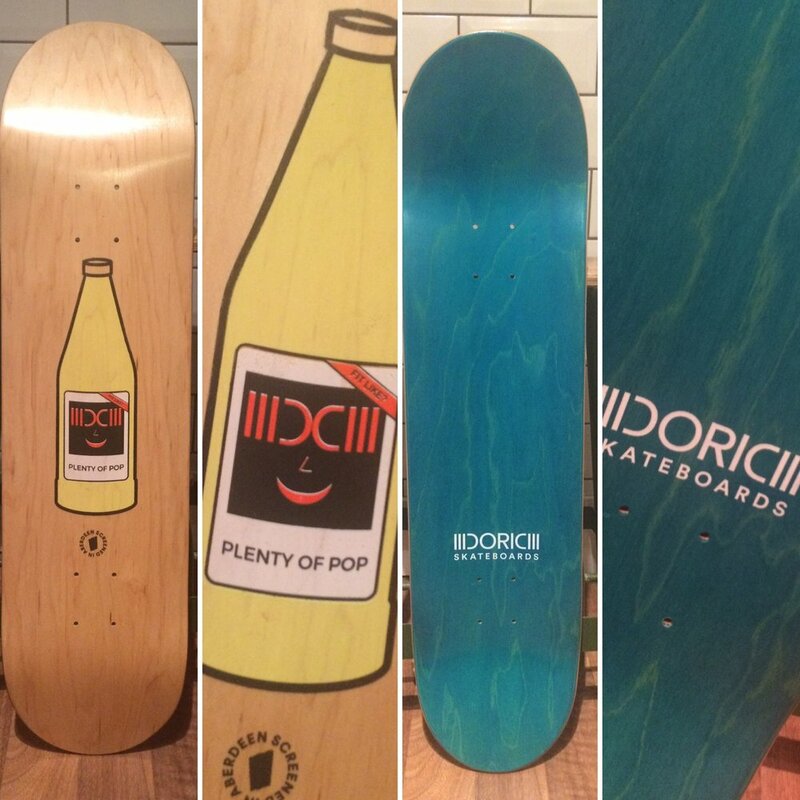 Doric Skateboards also happens to reside on land gifted to Aberdeen by Robert the Bruce. And so the cogs turn. Many a skateboard design has incorporated a bottle. Maybe i could do that too. I take the idea to Nicola and she runs with it and comes up with an amazing sketch that incorporates the shortened Doric Skateboards logo whilst still keeping the Bon Accord label face - see some early pics below! I can tell early on that this is a step up in terms of complexity to screen. Screening onto shiny curved wood is a challenge. Screening 4 colours and lining each screen up precisely is a tough nut to crack! Next time in the Doric Blog - multi screens & multi colours!